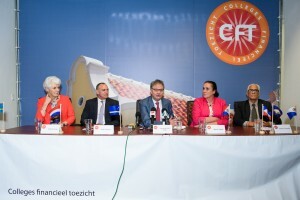 WILLEMSTAD - During its visit to Curaçao the Board of financial supervision Curaçao and Sint Maarten (Cft) once again emphasized that sustainable measures are necessary in order to achieve a balanced budget once more. Curaçao expects a deficit of ANG 116 million for the year 2017. The Cft has called for this deficit to be compensated as soon as possible and to tackle the structural causes. In addition to lagging tax revenues and exceeding expenses, there are various other risks that may have a negative impact on the 2017 result and the 2018 budget. Curaçao has prepared a set of measures to meet these challenges. The Cft has reached an agreement with the Minister of Finance about the monitoring of the effect and the implementation of these measures. A risk analysis has been promised. For the first time since 2012, Curaçao has a deficit on its budget and consequently does not meet the standards of the Financial Supervision Kingdom Act. According to the latest forecast, the provisional deficit 2017 amounts to ANG 116 million which must be compensated as quickly as possible. This deficit is caused partly by income that is falling behind, and that will also have an effect on the coming years. Moreover, there are several setbacks in regard to the expenses. Budgetary balance forms the basis for sound public finances. This contributes to the creation of a favorable investment climate and is therefore a prerequisite for the stimulation of economic growth. The government has therefore prepared a set of measures in December 2017. Last Monday an adjusted version was submitted to the Cft. This version largely meets the objections the Cft had on the previous proposal as presented by the Minister. For example, the 2017 deficit will be compensated for more than one third in 2018. In addition, two measures have been replaced by alternatives in line with the request of the Cft. However, some of the measures have not been sufficiently substantiated as yet. For that reason, up to now it cannot be established that the 2018 budget complies with the standards and that the 2017 deficit will be fully recovered. Curaçao has indicated that it will further substantiate these measures and in the event this is may result to be sufficient, an instruction will not be necessary. Finally the Cft has observed that the measure of preceding supervision has been instated, with which the internal control will be further strengthened. Various risks may affect specifically the execution and the 2018 budget in a negative way. The government has promised to prepare a risk analysis. That analysis includes among others the financial situation of Cpost, possible setbacks as a result of the HNO project and the state of affairs of Sehos. This week the Board will receive information on HNO, whereby it will insist on receiving an adjusted business case. Also the uncertainty surrounding the dividend payments by government entities has been mentioned. The developments concerning the refinery and economic impact thereof were also discussed. "A thorough risk analysis is needed, so that possible setbacks can be anticipated", chairman Raymond Gradus stated. It takes too long for the annual accounts of the Country to be adopted. For example, the Cft received the adopted annual accounts for the years 2012 and 2013 only in January 2018. The Minister has indicated that the findings of the National Audit Office, the SOAB and the Cft on the country’s annual accounts will be dealt with in a plan of action. It is important that the financial functions receive an impulse so that, among others, the accountability cycle can be improved. There is a constructive cooperation with the Ministry of Finance on that part of the budget in which the investments are clarified, namely the “kapitaaldienst”. The insight in this part of the budget has therefore improved. During its visit on 31 January, the Cft has indicated that in the future, it would like to ponder on improvements in the financial management in other parts of the budget as well, in collaboration with the Ministry of Finance. During its visit, the College spoke with the Governor, the Council of Ministers, the Minister of Finance and the financial committee of Parliament.